The Royal Alberta Museum opened in 1967 and has hosted an incredible 13,791,155 people since. In 2011, the Government of Alberta decided it was time to upgrade the old facility. With a new facility set to open in 2018 downtown, LIGHTVU had an incredible opportunity to showcase what it could do. Stantec commissioned LIGHTVU to design an outstanding curved wall for the museum, which can be seen as guests walk through the front door. LIGHTVU worked with the museum, Merge Systems and Stantec to provide a curved solution for the museum. Using their Aurora series, LIGHTVU created the custom wall. With its impeccable resolution, this screen will make an impression on anyone coming to visit the new and highly-anticipated Royal Alberta Museum. The best part of the project? Getting to come up with an innovative design, says Mark Silvius, principal of LIGHTVU. With millions of visitors sure to visit the museum in years to come, LIGHTVU’s curved wall LED display will stand out in their minds as they learn all about Alberta’s incredible heritage. Can you tell us a little bit about your role at Digital Edge Media, and about Digital Edge Media as a company? Digital Edge Media is an Audio Visual Integrator. We specialize in showcase and large format applications. I am the Regional Sales Manager for Digital Edge Media. What is your connection to LIGHTVU, and how did you both end up working on the Royal Alberta Museum project? Digital Edge Media is a LIGHTVU dealer, but the project was an invitation from another Audio Visual Integrator who partnered with us so that we could contribute a large format display. Especially Vince, who I believe is one of their Product Engineers. What he has the ability to come up with blows everyone’s minds on a regular basis. He is someone in particular that we take a concept or idea that we think is possible, and he will make it possible. He will turn a vision into reality. At what stage of the project did Digital Edge Media and LIGHTVU begin to work together? During the design stage of our proposal. Is that when you would typically partner with them? Yes. We get them involved so that we know if something is going to be feasible, practical and cost effective. Did you face any challenges or obstacles during this project? It would have been an obstacle for many companies to do a curve like the one we did [with the LED screen], but it was not really an obstacle for LightVU. There was potential [for a challenge/obstacle], but I would say they met the challenge. Would you recommend LIGHTVU to other companies? Why? LIGHTVU has displayed their ability to make a concept a reality in an application that, in the world of LED and display products, [the museum project] is small. It’s fantastic, it’s a showcase, a lot of people are going to see it, but they can adapt to much larger deployments, and with much larger companies than Digital Edge Media here in Alberta. The talent that they have can be repeated all over the world to meet all kinds of unique applications that haven’t even been thought of yet. I would challenge companies like us just to throw stuff at them and prepare to be impressed with the results. Would you work with LIGHTVU on future projects? Why? Yes. 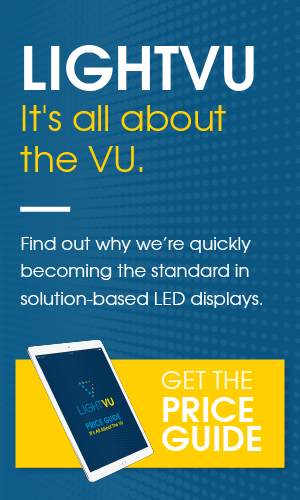 LIGHTVU is our go-to LED manufacturer because of both their wide range of cost-effective [solutions] to professional products with the complement of the custom [options]. Was the museum happy with the results of the project? They are happy. Because the museum is still just about to open, we are going to be going back and doing one more system check and run through and final alignment of the display before opening. But, we visited them only two weeks ago [week of September 10], and it was a great visit, they are very excited to launch. So, this LED screen, it’s in the concourse of the museum. Do people see it right as they walk in? It is centrally in the building. You would see the screen when you are standing waiting for information or ticketing. It’s essentially an information hub. What was your role in the Royal Alberta Museum project? I collaborated with both the other AV company that we partnered with and the consultant to provide a proposal for what would be suitable in the concourse area of the museum for a showcase, decorative type of LED display. What did the Royal Alberta Museum project require in terms of products such as LED screens? What was the overall scope? Digital Edge Media assisted with the design, supply and installation of the product for this project. We proposed the use of the LIGHTVU Aurora Series Display Product. Was there a reason that you proposed the Aurora Series Display Product? Yes. We wanted to use this series because, although they have standard models, what we wanted from the Aurora Series was its ability to do custom applications and we employed LIGHTVU to custom fabricate modules into the shape and size that were required. Most notably, there was a requirement for a curved wall, which Aurora was able to meet. It’s quite common to do a curve on a wall that is concave, but we did a convex curve, which is much more difficult to design, to supply and to install. Were there traits about LIGHTVU that stood out to you as a reliable and professional partner? If it’s not something that has been done before, they’re totally willing to dive in and get creative, and make something that is unique for that customer in their application. Next PostNext What are LED Displays Used For?